A comprehensive review of the Breville BES900XL. Product features, pros and cons, special deals. Dual Stainless Steel Boilers: Simply top of the line. Dual Stainless Steel Pumps: Ditto! Backlit LCD Display: Sleek, subtle and informative. Over Pressure Cooker: Features a state-of-the-art over pressure cooker system that limits the 15 bar Italian bump throughout the extraction process in order to limit burning. Multiplicity of Tools: Pressure displays, temperature readings, presets, overrides, with programmable infusions. User Friendly: It has plenty of customization all done in a user friendly way. 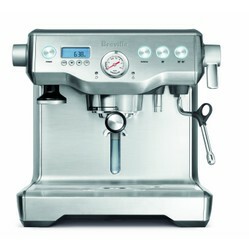 Breville = Apple of the espresso machine world. Small Footprint: For all that is has going on under the hood, it fits easily on a kitchen counter top without monopolizing space. 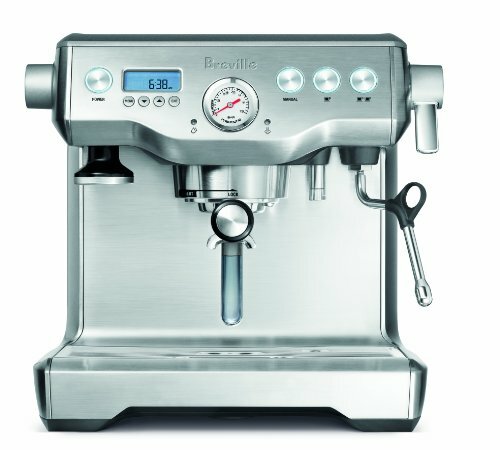 Perfomance and Taste: Every test I have done and every review I have seen points to the Breville BES900XL's superior performance in relation to other brand names. Most importantly, the taste is developed thoroughly with this machine. Whatever bean you input, you end up with a better tasting product that you would have expected. After tastes are drawn out, complex, and full bodied. The customization available is fantastic. There are enough options to keep you busy perfecting that ideal espresso. At the same time, if you just want a straight shot, there are easy one button presets that get the job done admirably. Elegant and Ergonomic: Every about this machine oozes intuitive design and thoughtful design. Everything right now to the little cubby that holds the cleaning supplies or the auto clean function that does most of the hard work for you. Best of all - despite its size - the BES900XL ups the real eastate of your counter top. Powerful but User Friendly: This is the Apple computer of the espresso machine market. Everything from the intuitive backlit display to the customization without over complication features. It is a joy to use. It can be as easy as the push of a bottom or as complex as your heart desires. It really does cater to every need you have out of an espresson machine. Easy Manuverability: There are nice little wheels on the bottom for easy moving around on the counter top. Great touch! CONS: Some people might think this is too expensive, but when compared with other similar products it really is competitively priced. My major concern is that every 4-5 years this baby has to be serviced which means direct from the manufacturer. It is not recommended that you do it yourself and try to be a hero. For some great action shots! The most popular Keurig K-Cups are the donut shop coffee and the Grove Square hot cocoa. To save money and get more of your favorites buy them here for the best deals on more. Don't feel like paying? Make a Starbucks Caramel Macchiato, hot or iced, right in the comfort of your own home with an espresso machine. Yum. Sipping on my morning coffee, I got to thinking about good coffee and what is involved in making a great cup of coffee.